I am pleased to announce that my short film version of The Burial is receiving a project grant from the Iowa Arts Council and that we will be shooting the short in NE Iowa this August/September. I will be adding the funds from the grant to the financial support of last year's crowdfunding campaign and other contributors. This means we have just enough money to officially give ourselves a green light. We will still need lots of support (financial, in-kind donations, volunteer help), but we can definitely move forward with this phase of the production. Huge thank you to all of you that have supported me through this process, and have given your time and hard earned dollars to make my film a reality!! Seeking a way to collaborate, Jack and fellow Des Moines filmmaker, Bruce James Bales are producing a short film: Undertow. Undertow is the story of a young man forced into the heroin trade when he finds his best friend dead of an overdose. In order to save his mother from her addiction, he must find a way to keep from being evicted from their low income apartment. 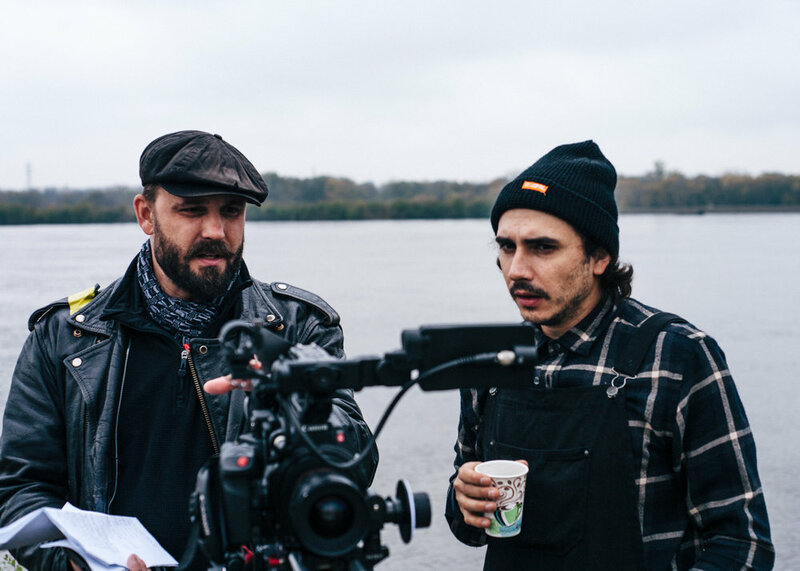 This marks the second collaboration of these two filmmakers, as Bruce operated the camera for the Sires music video, TURN IT UP. Principal photography is finished, and the project is currently in the editing phase of post production. Check out these behind the scenes photos of the filmmakers at work! Photos by Michael Watson. Thanks in large part to his 2017/18 Iowa Arts Council Fellowship, Jack has had a number of opportunities come up to collaborate with other local artists. Jack is pleased to announce an ongoing collaboration with Grinnell College Professor and fellow 2017/18 Iowa Arts Council Fellow, Lee Running. Lee's art project, CURE, will be the inspiration for a collaborative Art/Documentary film produced by Jack and Lee. Filming has begun and will continue for the next several years, as Lee's project contains a time related element and happens over seasons. Jack and Lee are currently seeking grant funding to finance their endeavor, and will continue to work on this film as time goes on. Stay tuned for updates!!! We've got two pieces of news for you that I'm sure you're already aware of, but we're updating the website and haven't mentioned the most recent developments... so here we go!! In of July 2017, Jack was selected to be an Iowa Arts Council Artist Fellow. he is among five artists selected for the honor, and is the first filmmaker in the state's history to be selected for the honor. You can read more about Jack's fellowship HERE. Additionally, Jack was selected as the Fall Season Artist in Residence for Ballet Des Moines! Jack was able to embed himself within the company for six weeks, during the creation of their fall performance, Triple Bill: Redefined, and was allowed total access to the dancers. He is now putting the finishing touches on a film he is calling PORTRAIT: A BALLET FILM IN FOUR MOVEMENTS. This film is about RESPECT. This film is about LOVE. It is about what it means to hold things SACRED. RAGBRAI 2017 IS COMING TO LANSING, IA. Well, 2017 is already off to a phenomenal start. We're getting closer to that magic number that will give us the green light to make our movie. Slowly but surely, I have been assembling a team of incredibly talented individuals for the production of THE BURIAL. And today, let me formally announce that Dylan Sires has agreed to come on board as a Producer, and will be composing the score. Well, as 2016 comes to a close , I find myself looking back on all I've learned so far. We've come a long way since THE BURIAL was conceived on a quiet summer day at the Effigy Mounds National Monument, five long years ago. The film has grown and shrunk, and feels like a living thing. It exists on a plane where it is already finished, and I am slowly and steadily willing it into existence on this one. The message has remained the same: Respect. Love. Preserving the earth for those that come after us. 2017 will reveal more secrets to us. What will we uncover? What will we unearth?